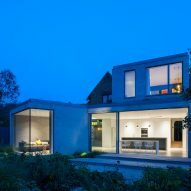 This angular extension to a typical suburban house in the English town of Weybridge was designed by Soup Architects to make the most of the unusually shaped plot. 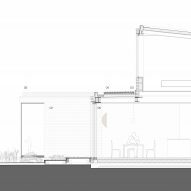 Soup Architects, which has offices in London and on the island of Guernsey, was asked to propose a strategy for modernising and extending the existing 1920s three-bedroom house. The semi-detached property is located on a private suburban close containing other homes of a similar age and style, which feature brick facades and hung-tile roofs surrounded by mature trees and planting. 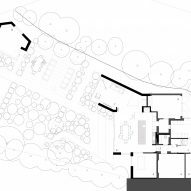 The house has a long north-facing garden that pivots as it extends away from the street, resulting in a secluded space enclosed by large oak and pine trees. Improving the relationship between the building and this underused outdoor space was a key aspect of the brief. 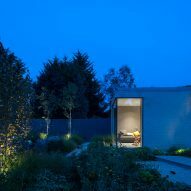 In addition to planning the rear extension as a container for new living spaces, the architects designed a new master bedroom suite on the first floor and a sunken study situated in a corner of the garden. 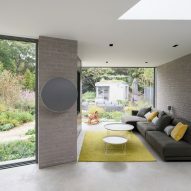 The new interventions are clad in light-grey brick and incorporate large openings that are carefully oriented to frame the best views of the garden from inside. 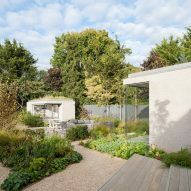 "Our approach has been to stretch a new ground-floor extension across the width of the site, maximising the space to the east as it opens up into the garden," said the studio. 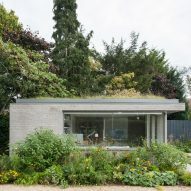 "A new lower garden studio has been set into the garden to create a stand-alone workspace, giving a different perspective and orientation to the main house." Inside the existing building, the architects rationalised the circulation areas to create a more fluid passage between the entrance and the new extension. 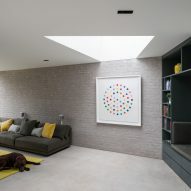 The palette of dark, natural materials in the old parts of the house was retained and provides a contrast with the light and bright spaces contained in the new addition. 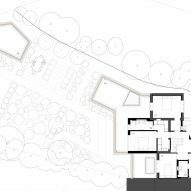 The extension accommodates an open kitchen and dining space, with a lounge area and reading nook occupying a cranked wing that projects out towards the garden. The rooms are lined with exposed brick that creates continuity with the exterior. 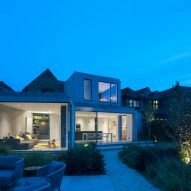 Whitewashed walls, large openings and a wedge-shaped roof light enhance the bright feel of the spaces, as well as providing the desired views of the garden and sky. 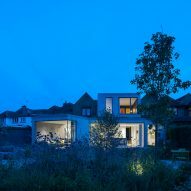 The aluminium-framed windows also provide glimpses of a new studio at the end of the garden, which echoes the geometric aesthetic and materiality of the main extension. The new bedroom, dressing area and bathroom on the first floor look out across the extension's planted roof towards the garden. Wild grass also covers the roof of the studio, helping to soften the visual mass of these structures and tying them in with the surrounding landscaping. 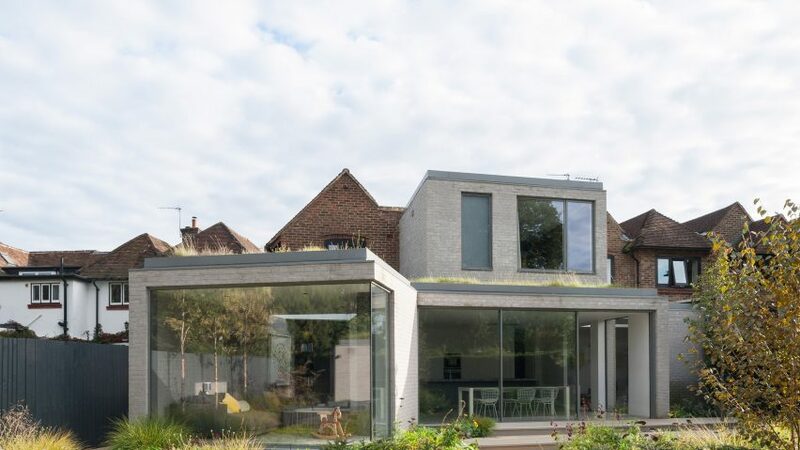 The project was included on the longlist for the RIBA House of the Year 2018, along with a house in east London featuring skylights and glazed openings that look onto a courtyard, and a south-London home with a decorative tiled frontage that references neighbouring properties. 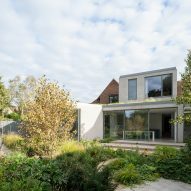 Soup Architects has previously completed a pair of matching artist's studios nestled in a leafy Suffolk garden and a riverside house in the same county featuring a crisp, white upper storey perched on a brick ground floor.